Heart Rate Monitor — Provides live, accurate heart rate and simplified heart rate zones.Transmits Heart Rate,Track steps, distance, calories burned and active minutes to compatible device.Short Click and Long Press Control. OLED Screen — 0.49″ OLED Screen Display, Hidden touch screen, Mini vibration alerts motor. IP65 waterproof heart rate monitor,not afraid of washing hands/ doing housework/ walking under rain. 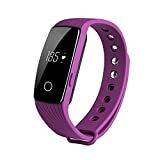 Multi-Function — RTC,Heart Rate Monitor,Pedometer,Calorie Burnt,Distance Track,Sleep Monitor,SMS Reminding,Call Reminder(caller name/caller ID),Sedentary Reminder,Calendar,Alarm Clock,Time Display,Anti-lost,Wrist Sense,Camera Remote Control,etc. Auto Sleep Monitoring — Accurate analysis of the sleeping quality , make you have a better understanding of the effects of sleep. Compatibility — Compatible with IOS 7.1 and above;Android 4.4 and above smart phones.Support Bluetooth 4.0. Android 4.4 or later: Samsung Galaxy S6 S6 Edge S7 S7 Edge NOTE 5 4, Nexus 5X 6P, Oneplus One Two, HTC M8 M9, Sony Xperia Z4 Compact Z5 Z5 Compact etc. IOS 7.1 or later: iPhone 4s 5 5s 5c 6 6s 6 Plus 6s Plus.